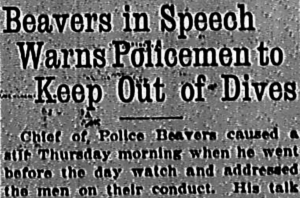 Chief of Police Beavers caused a stir Thursday morning when he went before the day watch and addressed the men on their conduct. His talk resulted from the recent scandal in which several policemen were found guilty of visiting a resort in the rear of 127 Auburn Avenue. The Chief will make a similar speech to the night and morning watches.